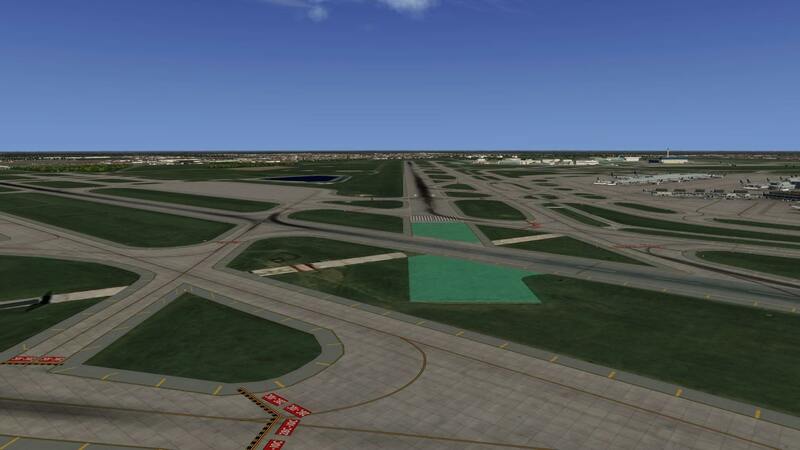 With a grand total of 9 runways and 1 helipad, Chicago O’Hare Airport (KORD) is probably unique with having the most runways at a single airport as far as I can tell at this point in time. 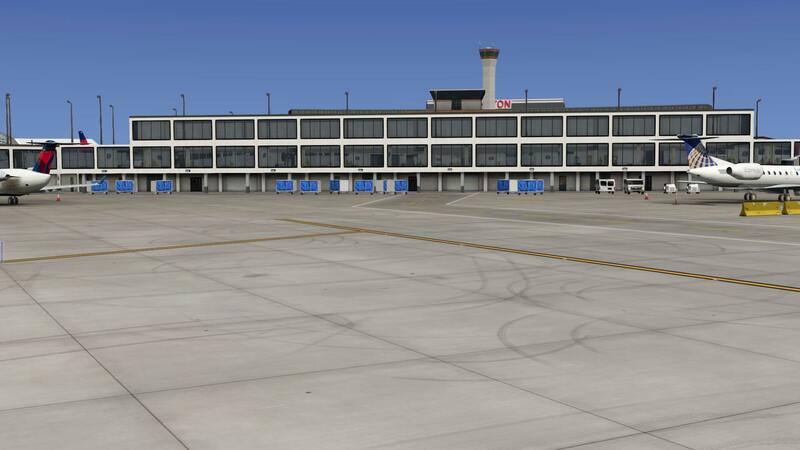 Also known for being the destination airport in the comedy film “Airplane!” – It’s one of the busiest airports in the world by number of take-offs and landings and was voted the best airport in North America for over 10 years. Nearly 77 million people passed through this airport in 2015. Probably due to this high number of passengers, it’s been also voted the 2nd worst in the US for delays, accounting for 20% of delays in North America. 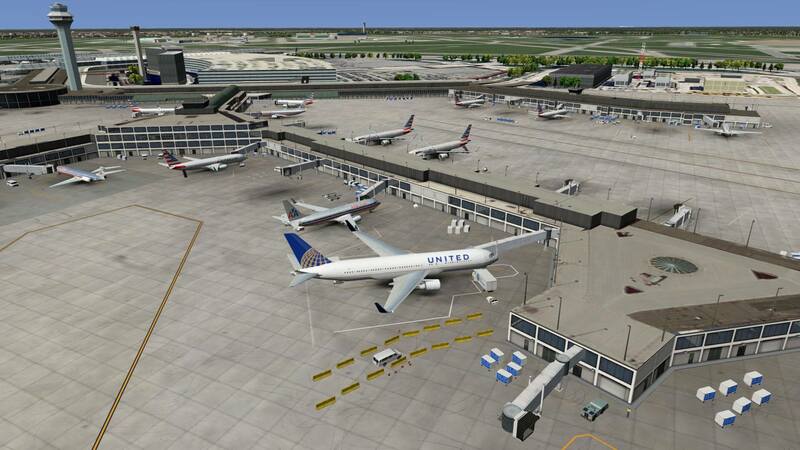 Over 200 hundred destinations can be reached from O’Hare with about 60 of those outside the US, so there is no shortage of potential flights within X-Plane to choose from. 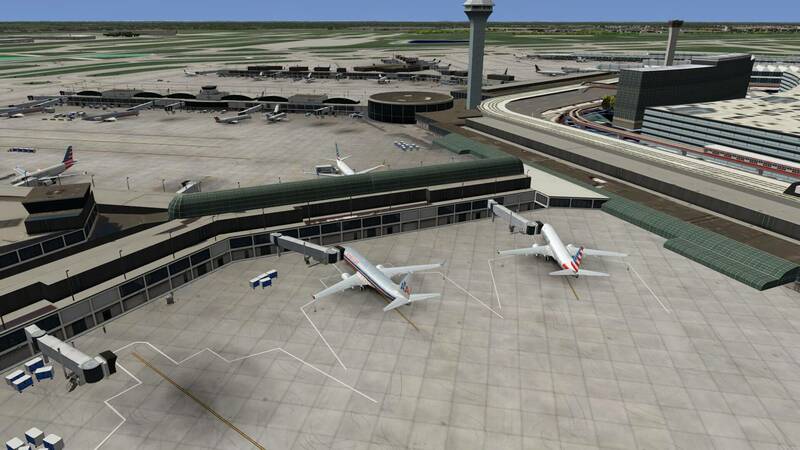 The Airport is a major hub for American and United Airline, and a Focus City for Frontier and Spirit Airlines. 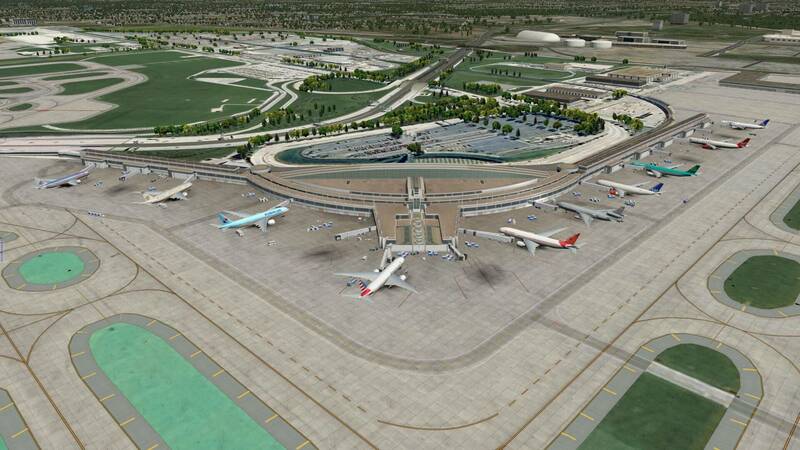 It consists of 4 passenger terminals (1-5) and a completely automated light rail (Airport Transit System) runs from 1-3 to connect to terminal 5. More information can be found on the dedicated Wikipedia web page and the AirNav page. 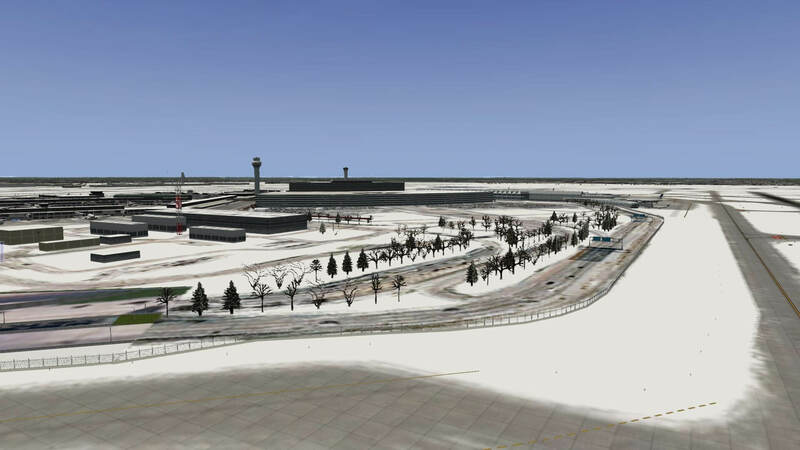 This latest offering of KORD ‘O’Hare for X-Plane – Version 1.0 is from Nimbus Simulation Studios (you might know this developer better as Butnaru – creator of KATL and KMIA sceneries. 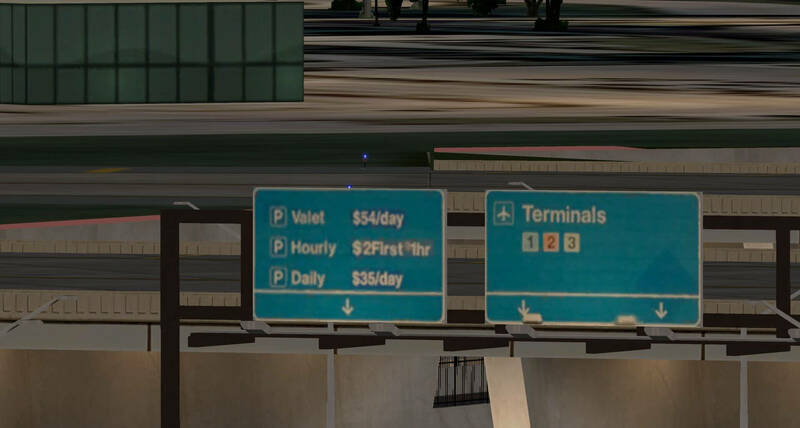 While there are some freeware sceneries of O’Hare available on the .org site, this scenery is a high-definition version of his earlier offering and an almost unique feature here is that the terminals have transparent textures a feature which I haven’t seen Nimbus use before in his sceneries. This feature allows you to see passengers inside. 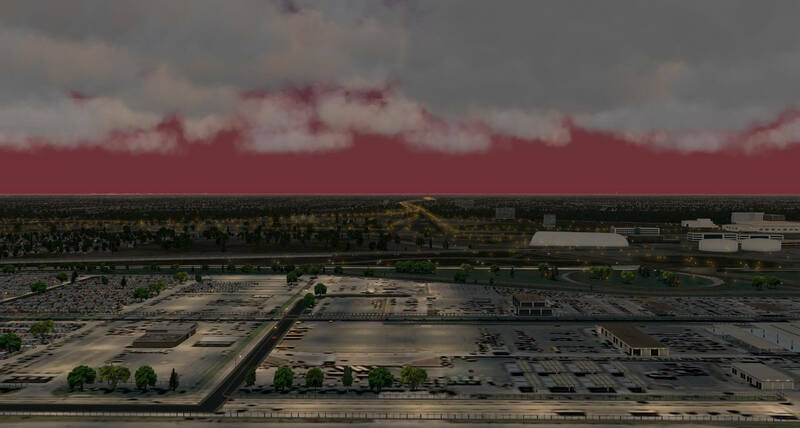 This is old-hat now in FSX/Prepar3D, but in X-Plane, this is seen few and far between, and is often a deal-breaker for me when choosing sceneries. Indeed, it’s a pet peeve of mine with commercial X-Plane Sceneries that they are not quite in the same league as their FSX equivalent. 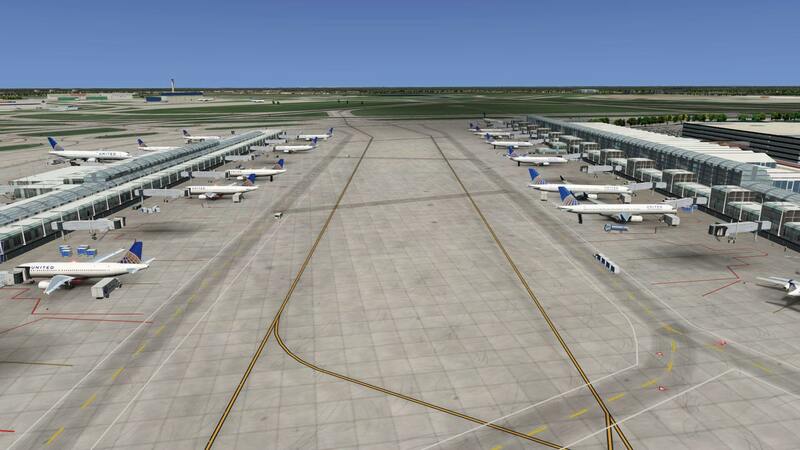 I guess this is really due to fact that X-Plane in general, has a smaller market than FSX or Prepar3D does, so less resources are poured into this market. I hope to see more and more developers take this approach as more and more users are discovering what X-Plane has to offer. 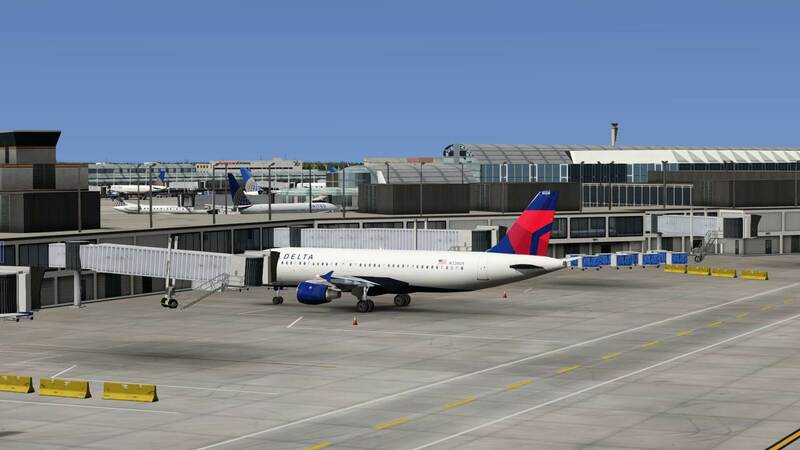 The bar is slowly getting raised with X-Plane aircraft and hopefully, sceneries will also take the same path. 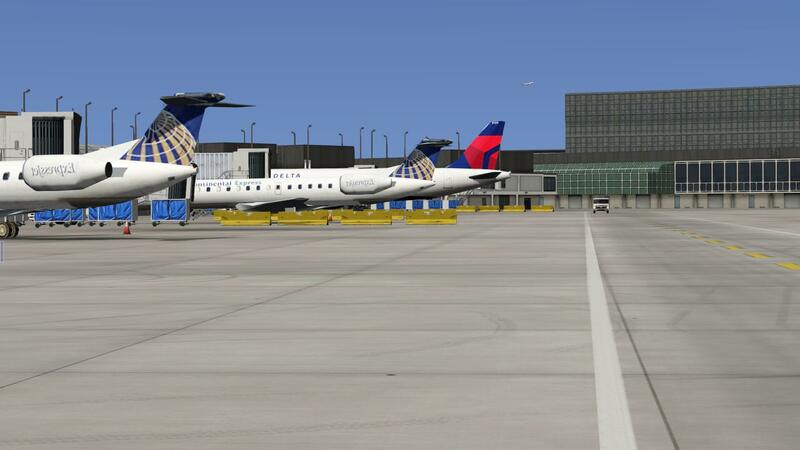 Another unique feature I have not yet seen is a seasonal option for KORD. You have the choice between summer and winter textures, which involves copying and pasting from one folder to another and allowing the files to get overwritten. 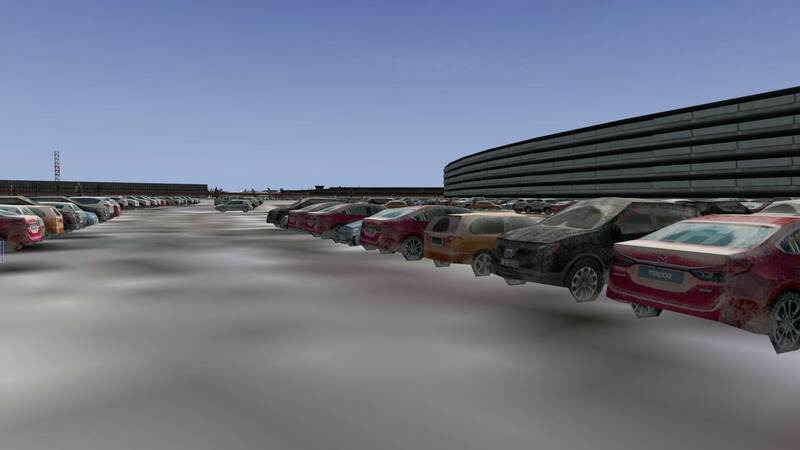 The next time the scenery is loaded, you have iced-over aircraft and white ground textures. 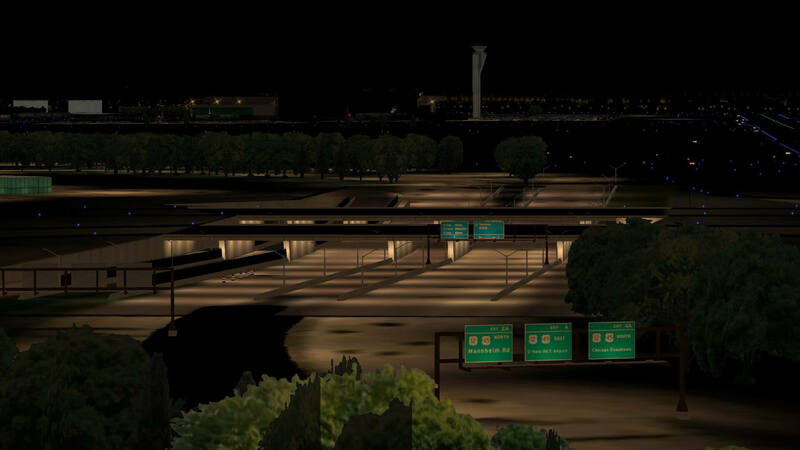 Of course, this looks a little odd when the rest of X-Plane is green, but it’s a nice feature to have given that X-Plane plans in the future to have more seasons implemented. 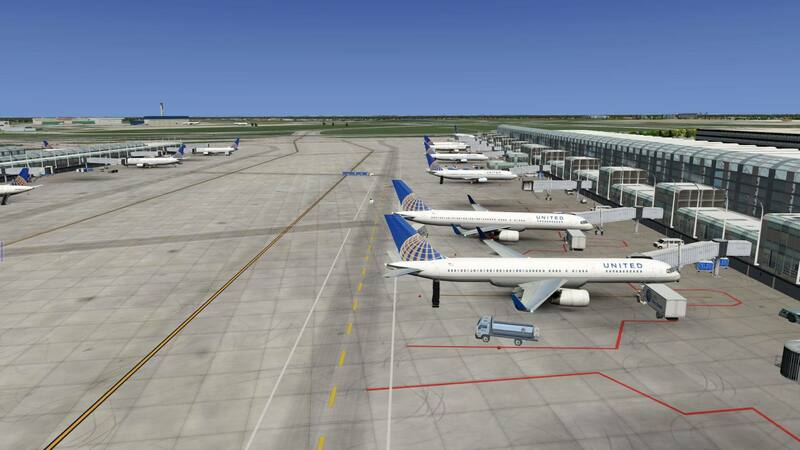 Terminal 1 is mainly used by United, United Express as well as Lufthansa and ANA which comprises of 50 gates divided into two concourses and an underground walkway tunnel connects the two concourses B and C together. 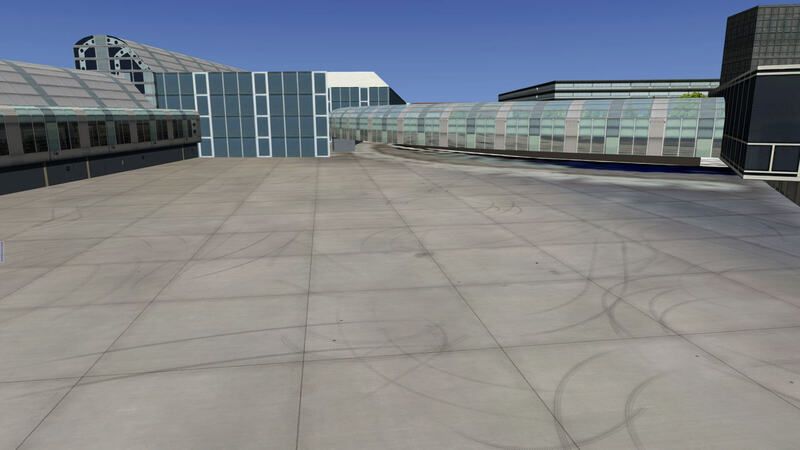 It consists of two parallel glass fronted structures on the west side of the main terminal building. The new terminal 1 was built between 1985 and 1987 and was built on the site of the old international terminal and part of terminal 2. 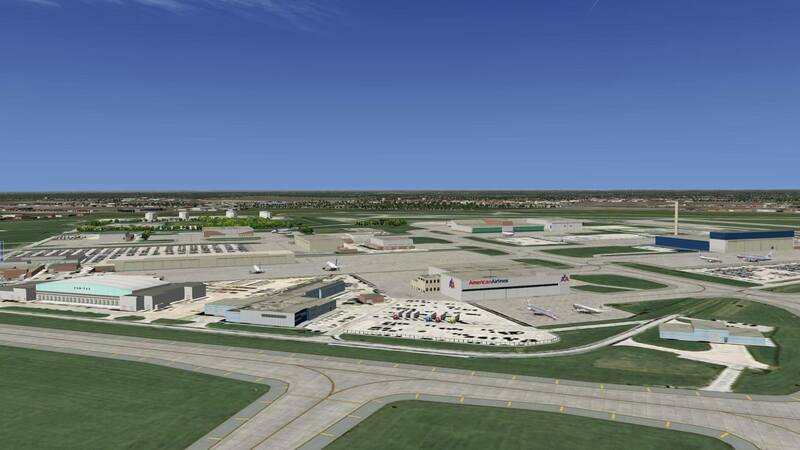 Terminal 2 takes Air Canada, Delta and the commuter Delta Connection and United Express and flights. 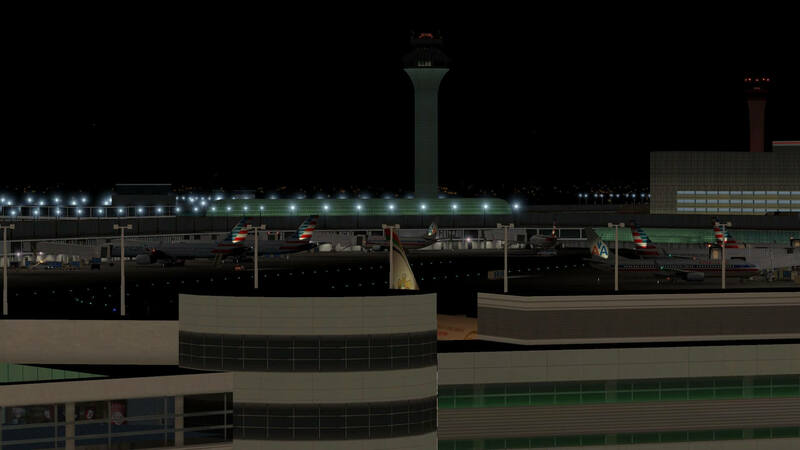 Before US Air merged with American Airlines, they also used to be based in terminal 2 until July 2014 when they relocated to Terminal 3. 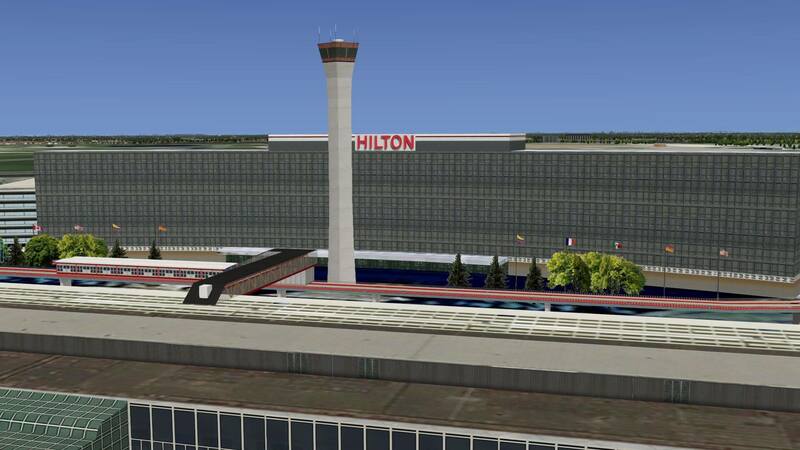 It’s an elongated “Y” shaped building on the south-west side of the Hilton O’Hare Hotel. 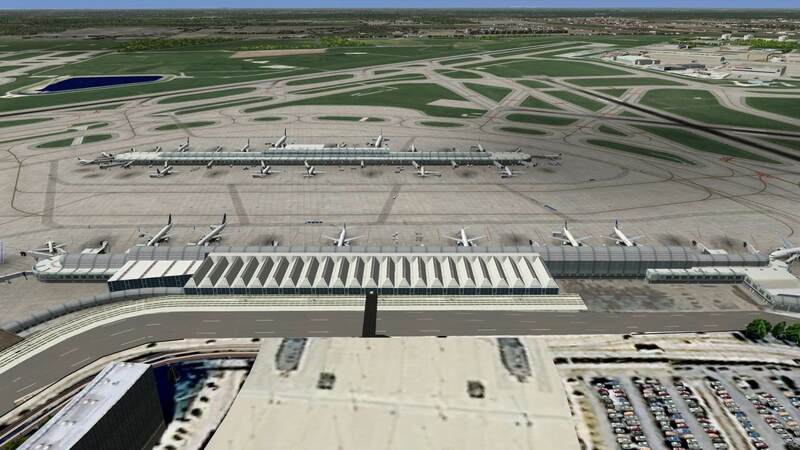 Terminal 2, 3 and 5 are conventional structures. 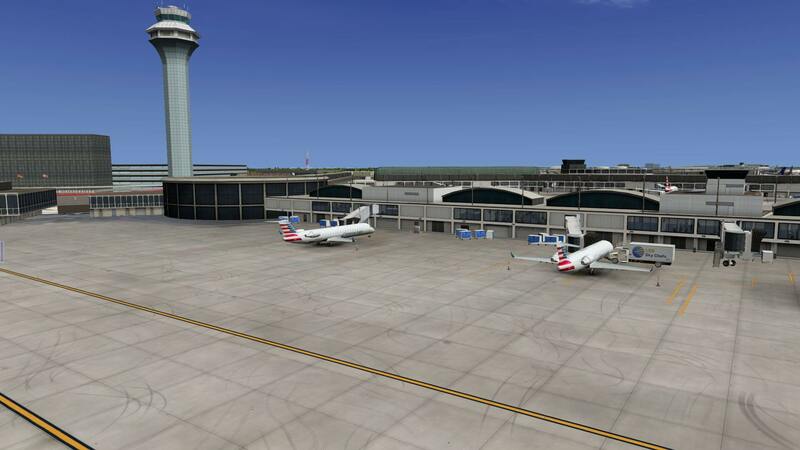 Terminal 3 -Consists of concourse E and F, to the south east of the Hilton is a “W” shaped building and is home for American Airlines, as well as Air Berlin, Japan Airlines and Iberia Airlines, as well as low-cost airlines such as Spirit, Alaska, JetBlue and Frontier. The concourses are labelled E-L (excluding the letters I and J). Terminal 5 consisting of one concourse – M – at the eastern point of the airport, is the international terminal used by such carriers as Aer Lingus, British Airways, Etihad, Air France, Swiss and SAS. It’s planned in the next year to accommodate the Airbus A380, so an opportunity here to use Peter’s A380 from Heathrow exists. This terminal includes the US Border Pre-Clearance section. 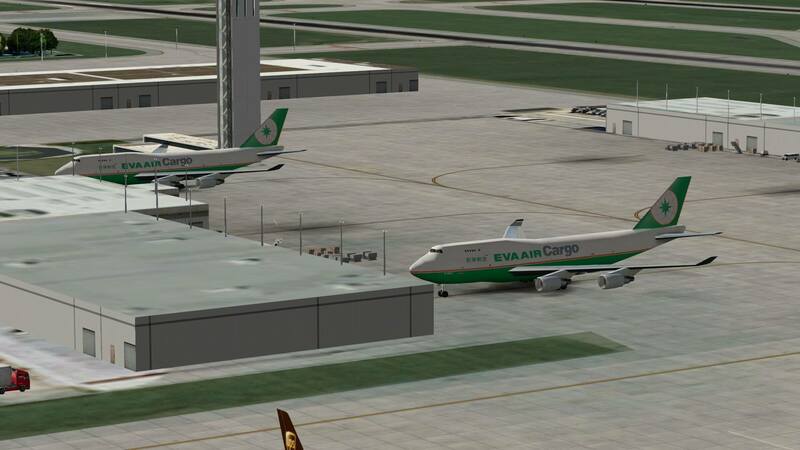 There are also two Cargo Terminals, North and South-West. The North Terminal is a conversion of the original Douglas Plant Area which manufactured Douglas C54 Transport aircraft during World War II. 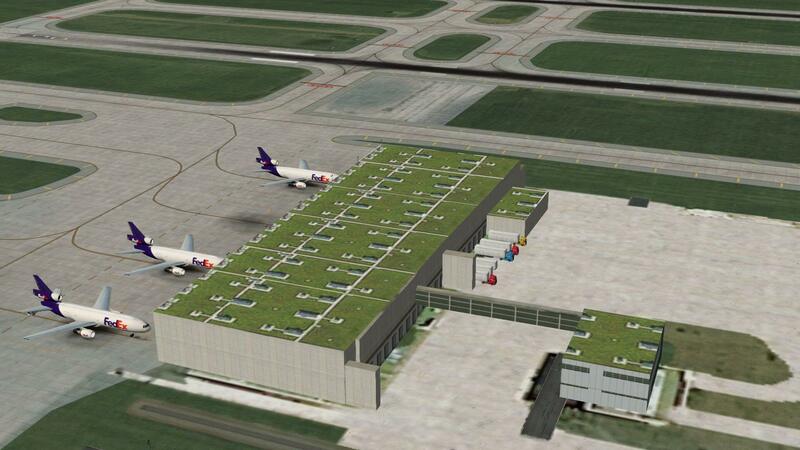 The south terminal, a much bigger one accommodates up to more than 80% of the total cargo flights. A total of 4 fire stations complete the picture. 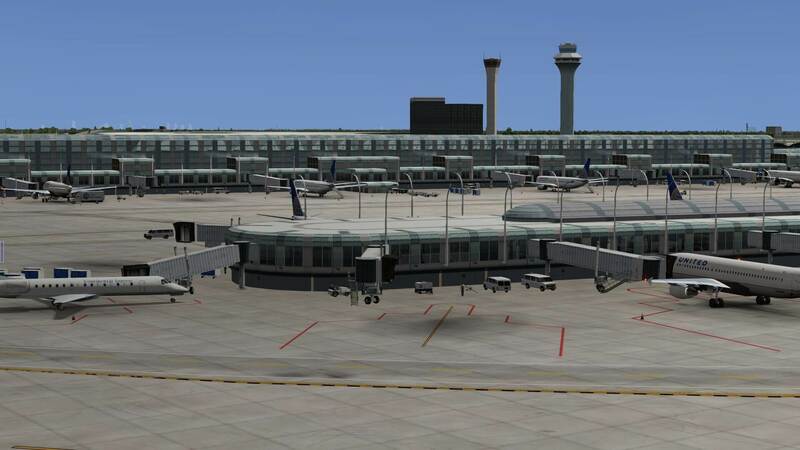 According to the X-Plane.org, the following features are listed in the Nimbus Chicago O’Hare X-Plane product. 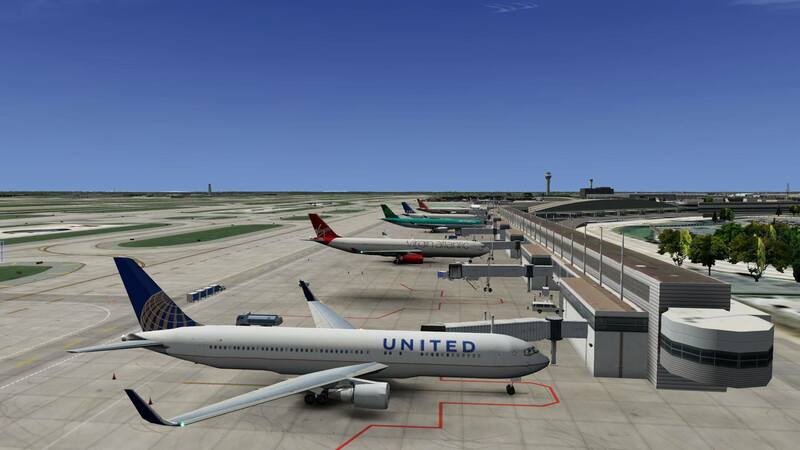 Installation of sceneries in X-Plane is generally easy and this product is no exception. The scenery is a simple zip file which contains both the scenery and a simple README.pdf file. 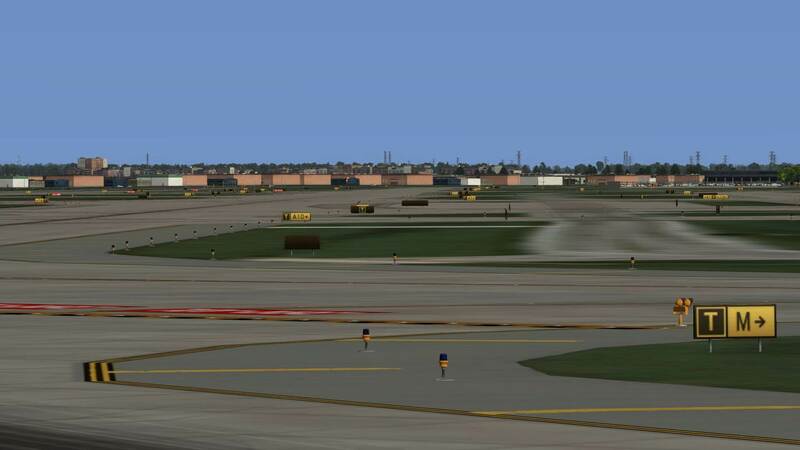 A simple extraction of the folder, and placing it into the “Custom Scenery” location inside the X-Plane folder is enough to install the scenery. 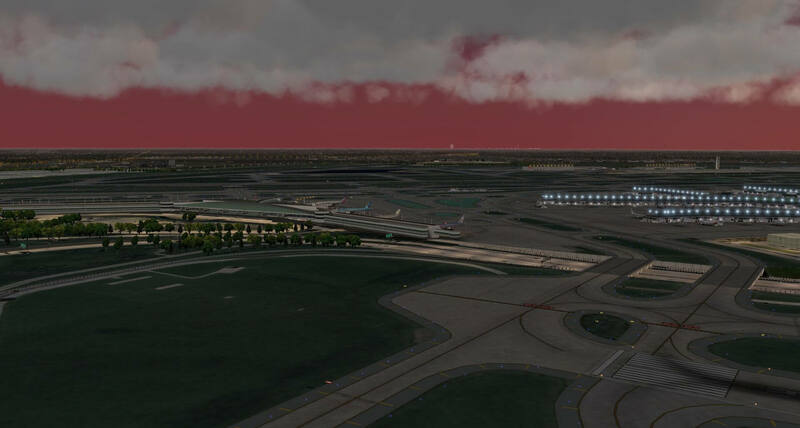 When this is completed, you will have a folder called “Nimbus Simulation – KORD – Chicago” in your custom scenery location. 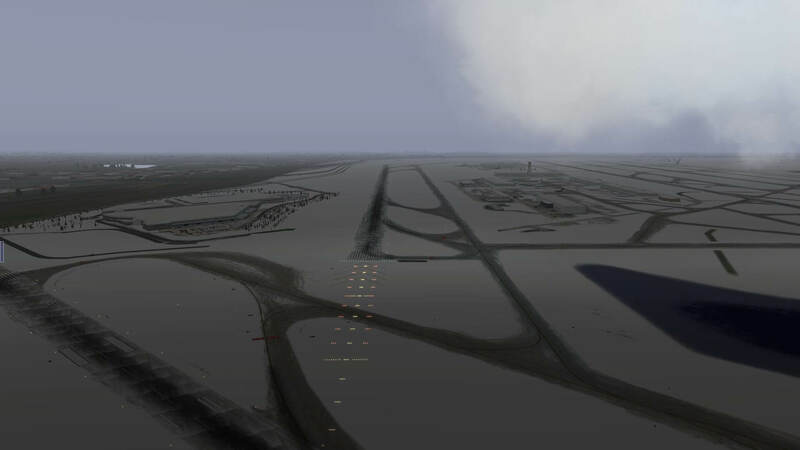 As seems to be customary in all Nimbus add-ons, the “runways follow terrain contours” needs to be unchecked, if this is not the case, uncheck it and restart x-plane to have the changes take effect. 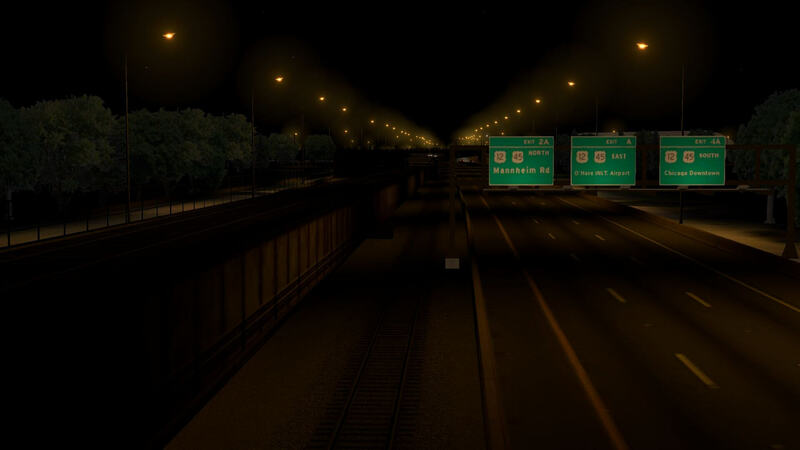 It’s a pity that this needs to be done for this scenery as it does take away from the realism a little bit. 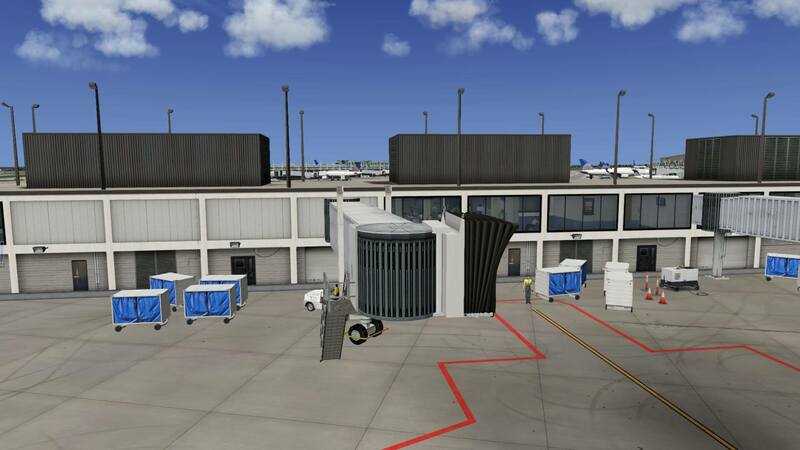 There is also a provision for the Autogate plugin which can be downloaded from this link which greatly adds to the realism and gives an extra layer of reality to the picture. As I mentioned already, there are two seasons available to use – summer and Winter, but as the manual states, this is not automatic. As per the README.pdf file, the two seasons need to be set as follows – default is set to summer. In the “Nimbus Simulation – KORD – Chicago” folder once installed, there are 4 folders in which there are two subfolders containing “summer” and “winter”. These are: “Aircraft”, “Cars”, “Earth nav data” and “Trees”. To accomplish season changes some copying and pasting of files needs to be done. For instance, to have “winter” trees, the files need to be copied from \Trees\Winter back into the Trees folder. It’s important not to cut any files, but always overwrite the existing files. The same procedure needs to be done for Aircraft, Cars, and Earth nav data too, otherwise the scenery will look a little odd. You can even see a de-icer in action when the winter textures are set! 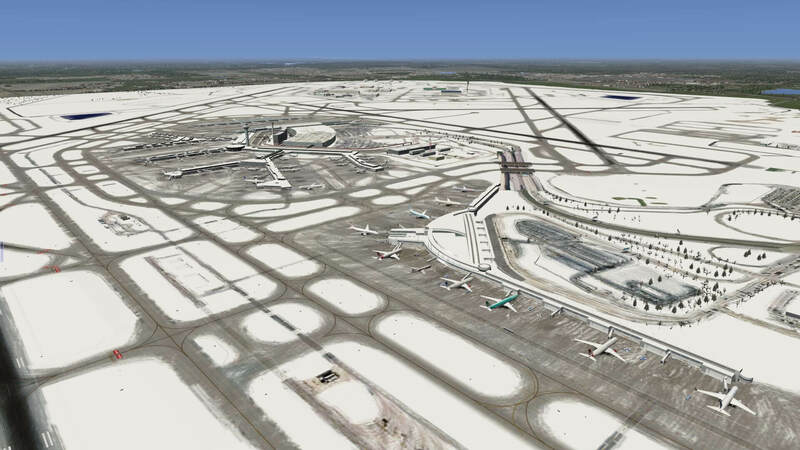 Wow, I know America has some big airports compared to Europe, but although there are only 3 terminals, the 9 runways make it a bit of a taxiway trip to make it to the designated runway. 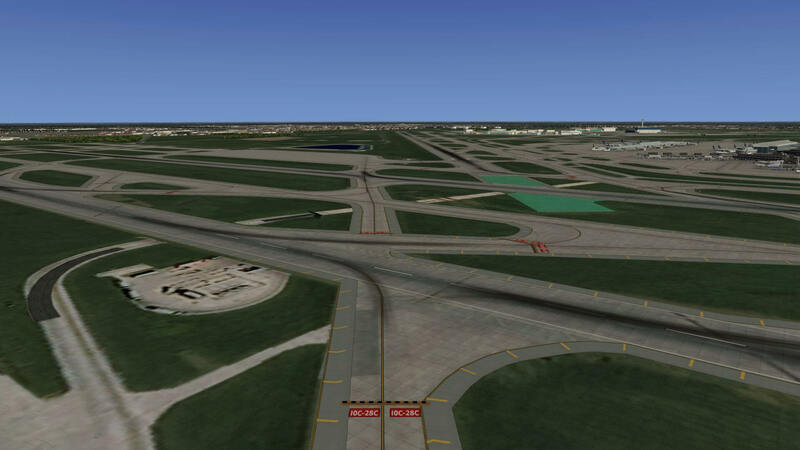 It’s very easy to get disorientated without ATC to direct you as it does in FSX. The charts therefore are invaluable in this regard. 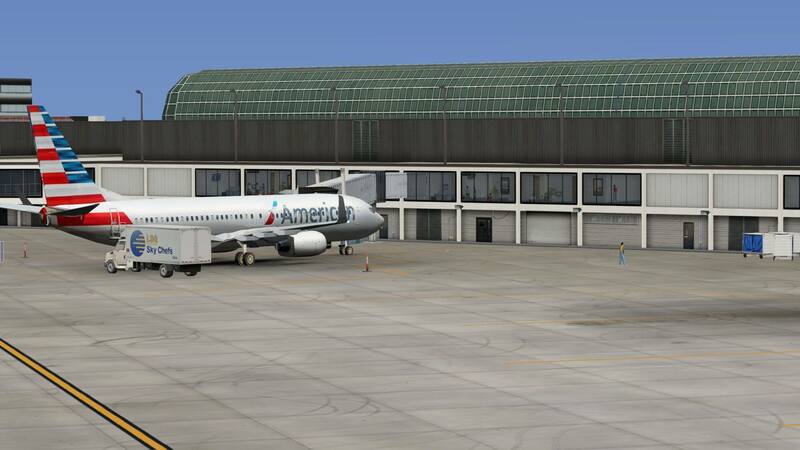 The mainly glass-constructed terminal 1, is something I haven’t seen yet in a scenery. This is definitely the feature of the whole of this scenery and your complete attention is focused on this terminal and so it should be! 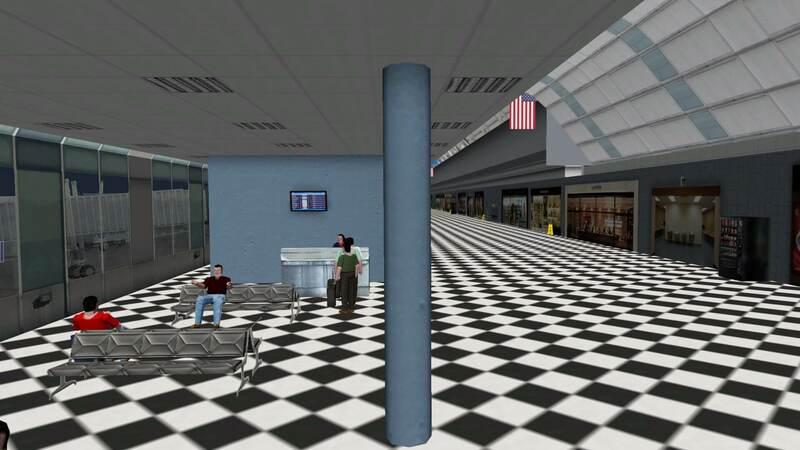 The interior of the terminal can be clearly seen with the black and white checkered floor and passengers sitting or reading the announcement boards. 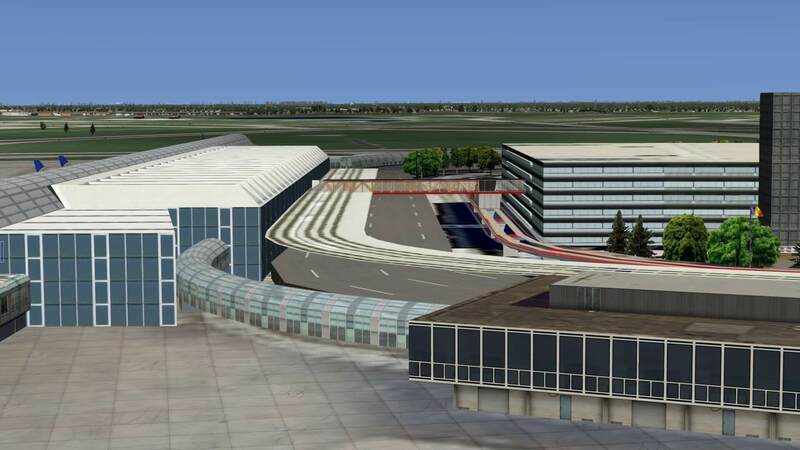 Of course, the tunnel is not present since it’s underground, but there are some greyed out sections visible from the outside, so this could well be the location from inside the terminal. 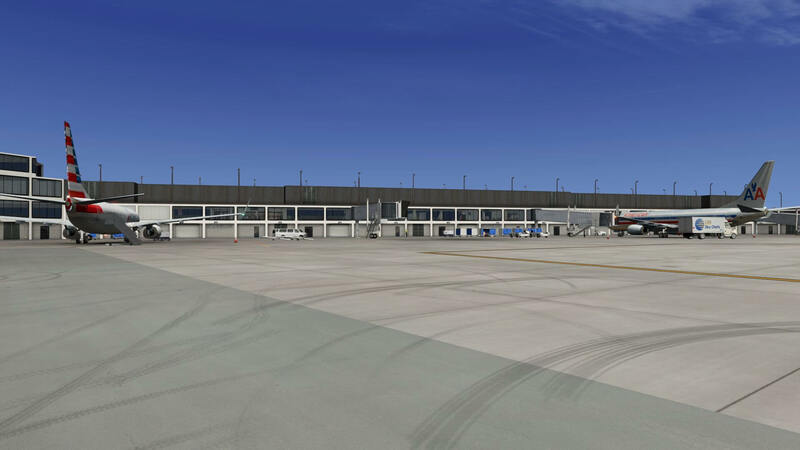 Terminal 2 is a more conventional shaped terminal, but the interior is still visible and contains lots of Delta and Continental Aircraft to keep you company. Terminal 3 is about the same appearance as terminal 2, and terminal 5 is also of conventional design although it’s a bit smaller than terminal 2 and 3. Starting at terminal 1, which is a single-storey U-shaped cross section terminal mostly of glass and (presumably) steel. There are many activities taking place when parked at the gate, and baggage carts and utility vehicles enough to satisfy the most discerning visitor. 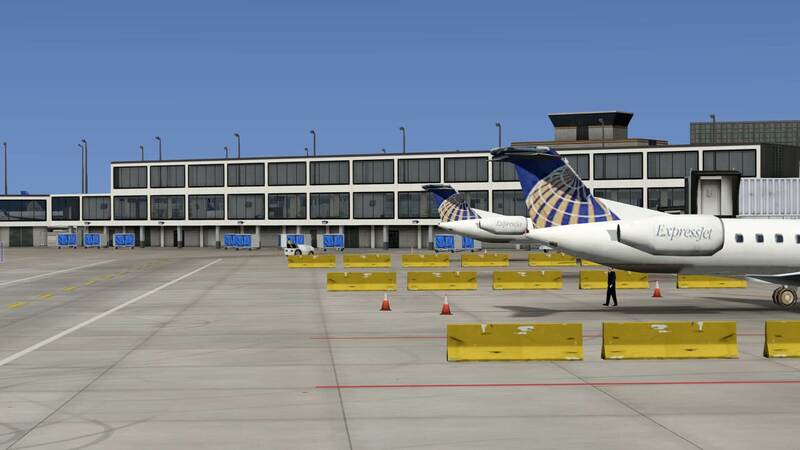 It’s populated mostly with United Airlines short-haul aircraft and it’s quite a pleasing terminal to arrive at. There are no shortage of passengers visible inside the terminal waiting for their flights and it gives the impression of a busy terminal. 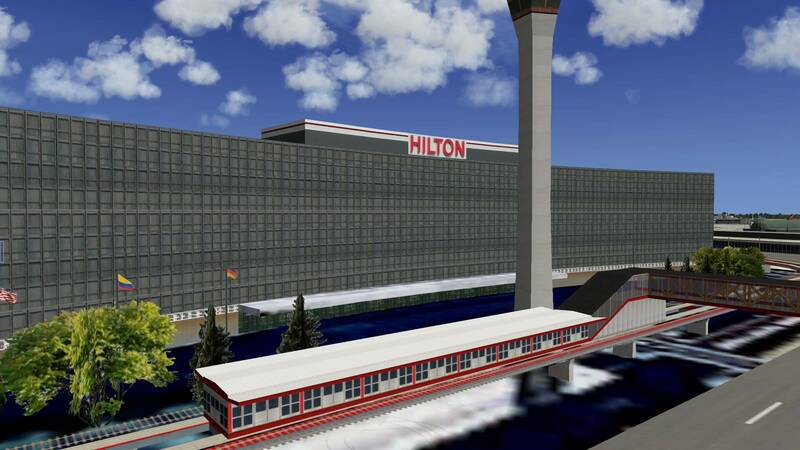 There is a walkway which leads from Terminal 1 to the Hilton hotel and to the light rail system. A walkway also leads from the Hilton hotel to terminal 2. The hotel itself is well defined and the well-known logo is visible from almost everywhere on the airport grounds. Directly in front of the Hilton Hotel which has a capacity of no less than 860 rooms, lies the old Control Tower which was replaced in 2008 by the new one. 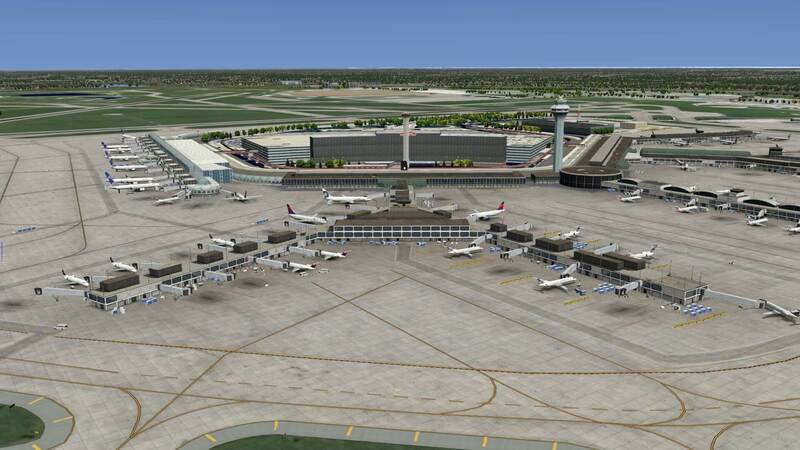 Moving to terminal 2, which as I said before, has a Y shaped layout, is mostly for Delta airlines. 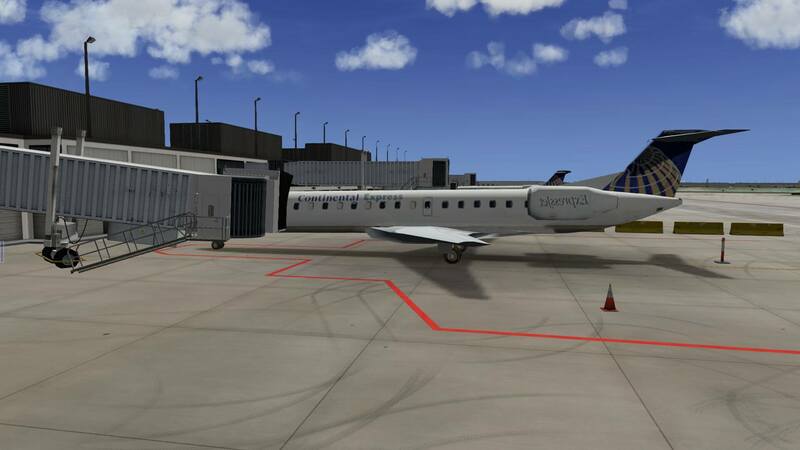 There are also some Continental Express CRJ aircraft present and they look pretty good except there are some mirroring of textures on the engine cowling, but this is just a minor thing and not noticeable with everyday usage. 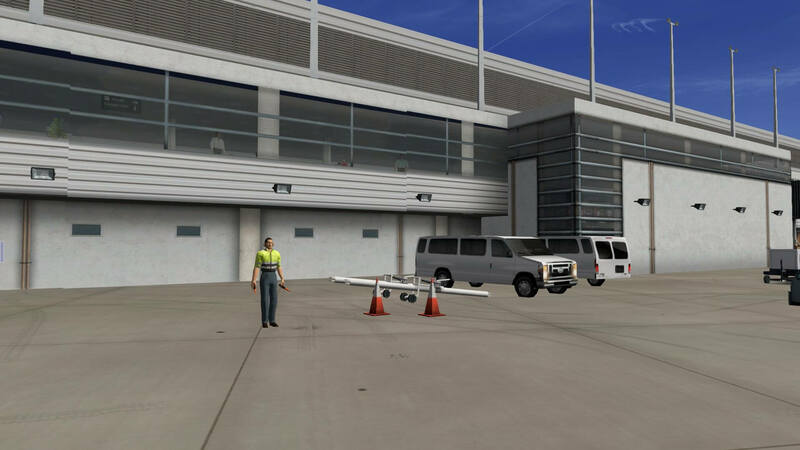 Again, the transparent windows are pleasing to the eye, and there is plenty of ancillary airport items such as fuel bowsers, baggage carts and catering trucks dotted around and it also includes marshals to guide you to your gate, similar to FSDT ground services does in FSX. 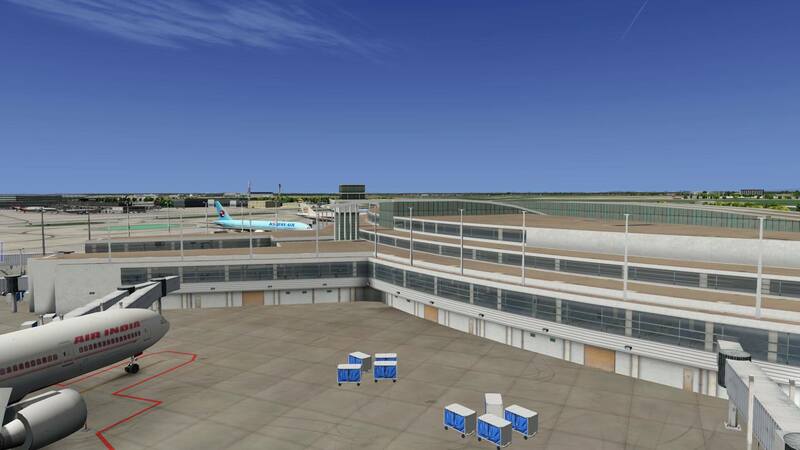 Terminal 3 is next and it can be distinguished by the new North Terminal Control tower which having been built in 2008 and having arches over the terminal buildings. The aircraft here are mostly American Eagle CRJ’s and American DC9/MD80’s which are all beautifully done. It’s also well-endowed with baggage carts and other ground equipment which has an excellent “as real as it gets” weathering effect. 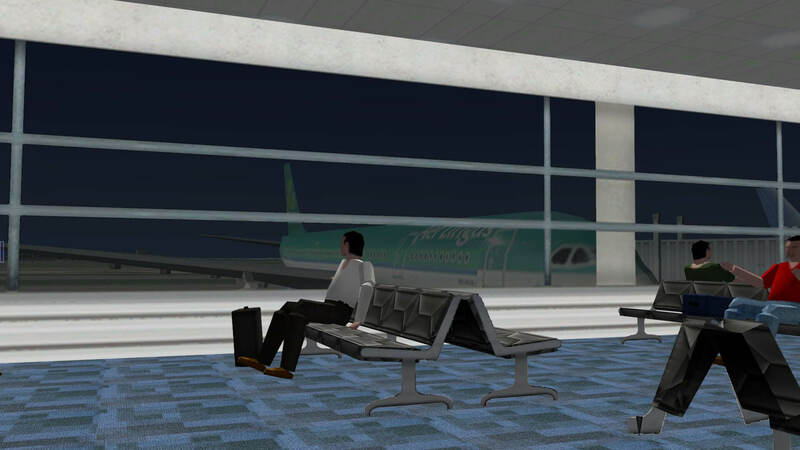 There are also animated passengers inside which can be seen happily strolling around (they must have plenty of time! ), at their leisure. 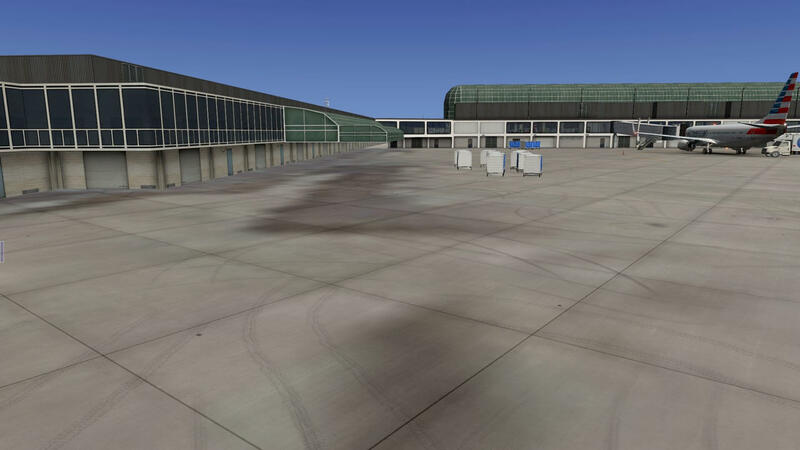 The roof of both terminals 2 and 3 have Air-conditioning units of different types as can be seen in the screenshots, and part of terminal 3 has a glass roofing and shelter (presumably the older part of the terminal). Moving on, the next structure according to the map, is a fire station – Fire Station 3 if it reads correctly. I don’t see any fire trucks there just some warehouse buildings, a radio mast and some office buildings and smaller separate buildings which might be a fire station, but there are no trucks there to clarify what exactly I am looking at. I can only go by what the map tells me. 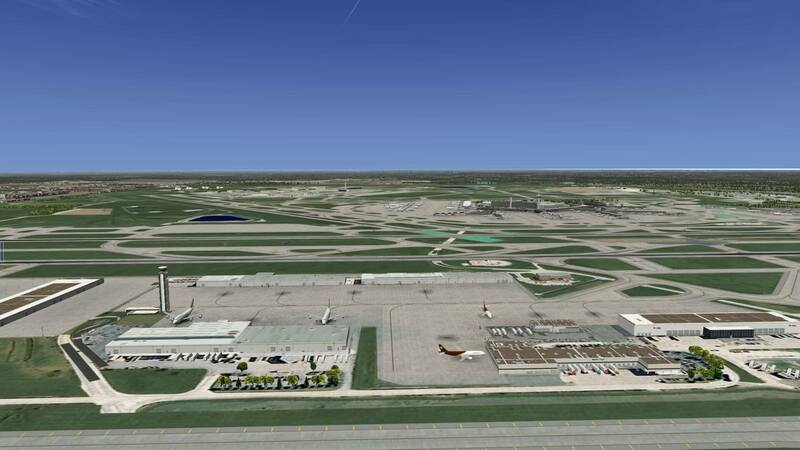 Moving east, we have the last passenger terminal – terminal 5. 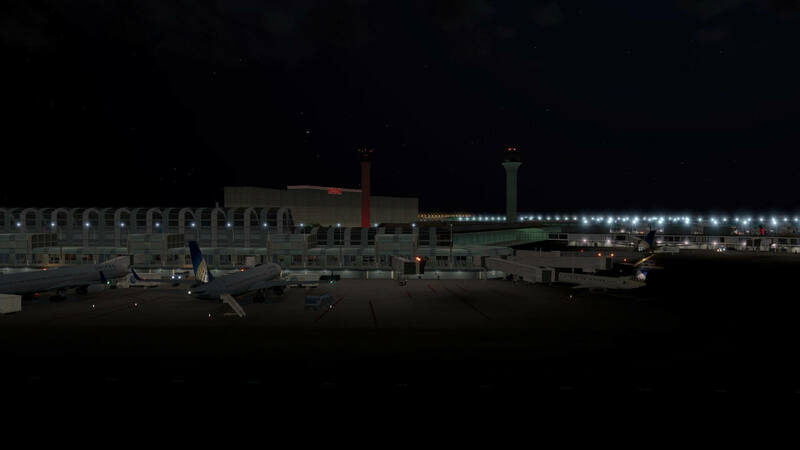 This is the International terminal, and there we have to keep us company two American Airlines 777’s, An Etihad 777, A Korean Air 777,, Japan Airlines, Korean Air, Air India 777, An SAS A330, An Aer Lingus A330, A Virgin Atlantic A330 and lastly a United 767. 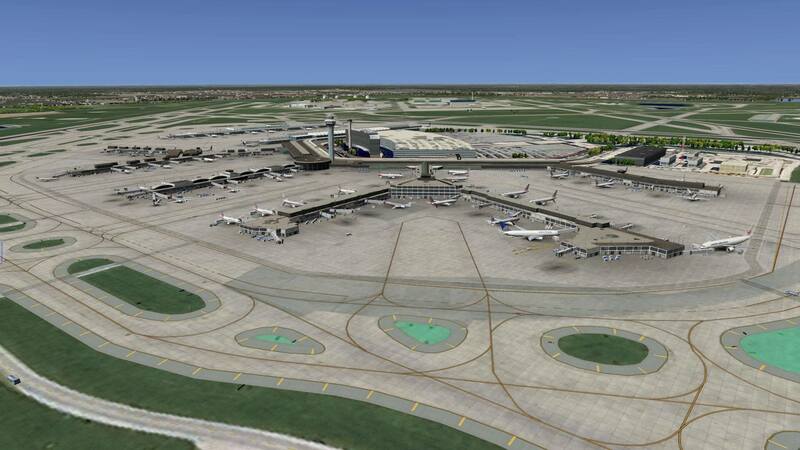 This terminal is not large compared to 2 and 3 and is again of conventional design. Again, you can see the interior and some more relaxed passengers. 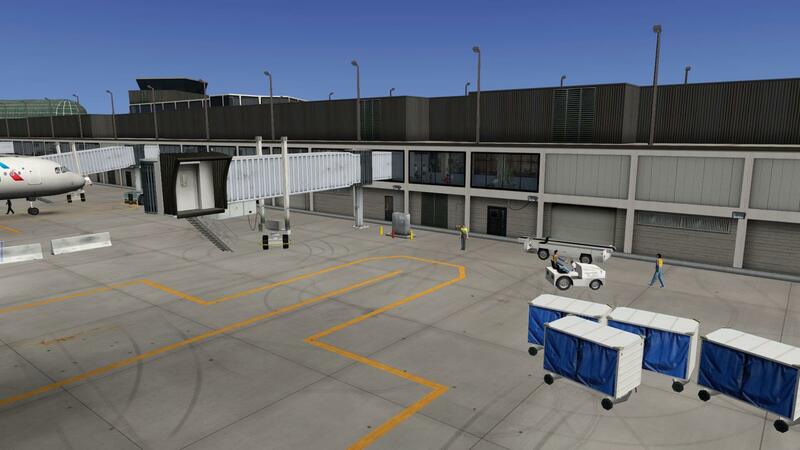 The animated baggage carts and fuel bowsers are busy here too, giving the appearance of a busy airport. Moving North-West, I was hoping again to see a fire-station, but although there are plenty of buildings marked “American Airlines” and plenty of 3d cars in car parks, all I really got to see in the way of fire activity was a pair of generic fire practice units that look like MD-11s., and a non-too detailed Control tower. 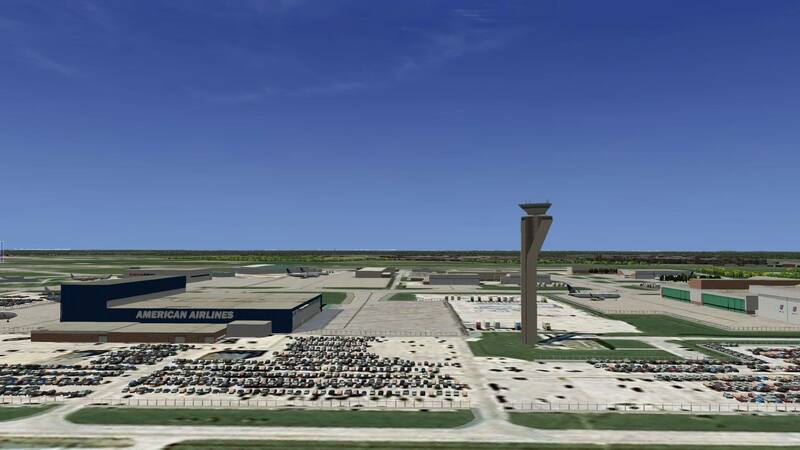 From looking at information about this control tower, it appears to be the newest addition to the family which was completed in 2008. Moving to the General Aviation ramp on the eastern boundary of the airport there were very few buildings here. 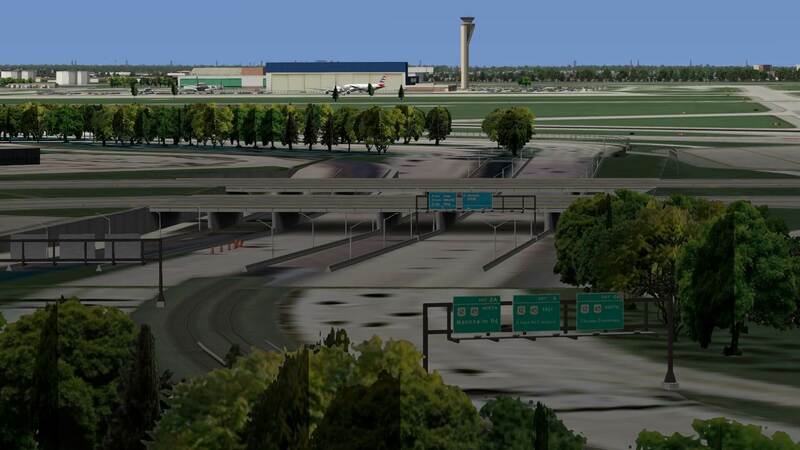 I changed my rendering settings for “Airport” to “extreme” to see would this make a difference, but in this case, I could see no changes as far as this area was concerned. There is nearby a Target Store with the appropriate roundel painted on the roof and the adjacent “Allstate Arena” home to the Chicago Wolves Hockey team and the Chicago Sky basketball team give you your bearings. 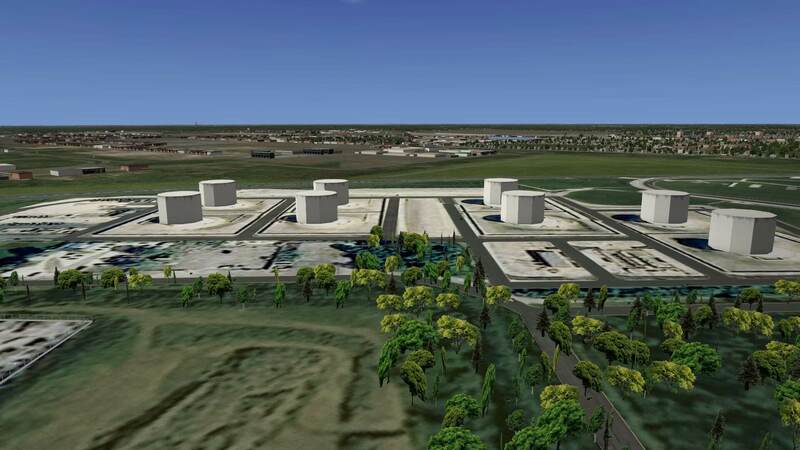 Moving south to the last area is the south east, south central and south west cargo terminals. These are better represented with trucks, and some UPS and EVA Air planes to keep you company. 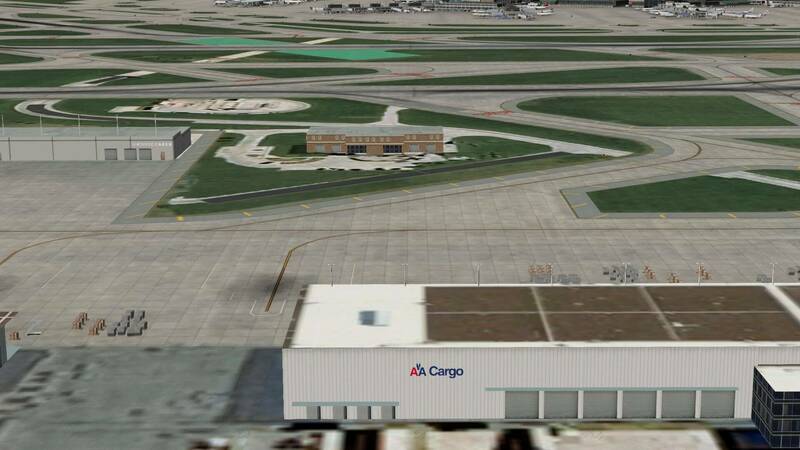 And just in case you think that’s a texture error on the south Cargo terminal, think again! 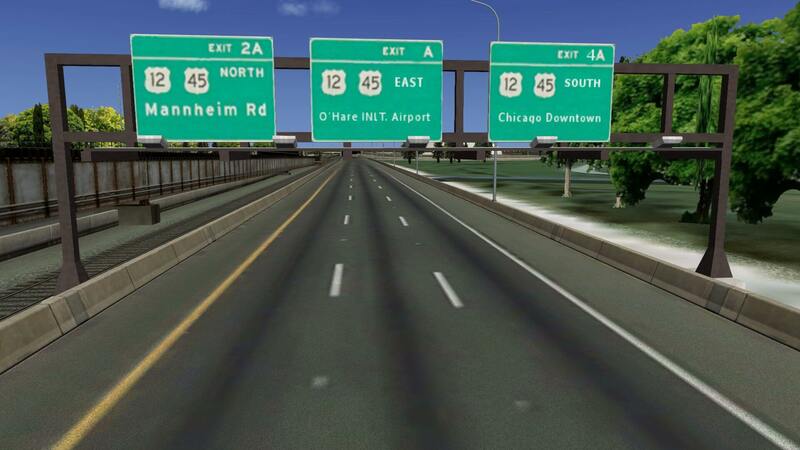 This is actually part of the green initiative by O’Hare to reduce heat, storm runoff, and conserve energy. That’s the kind of attention to detail I get excited about. 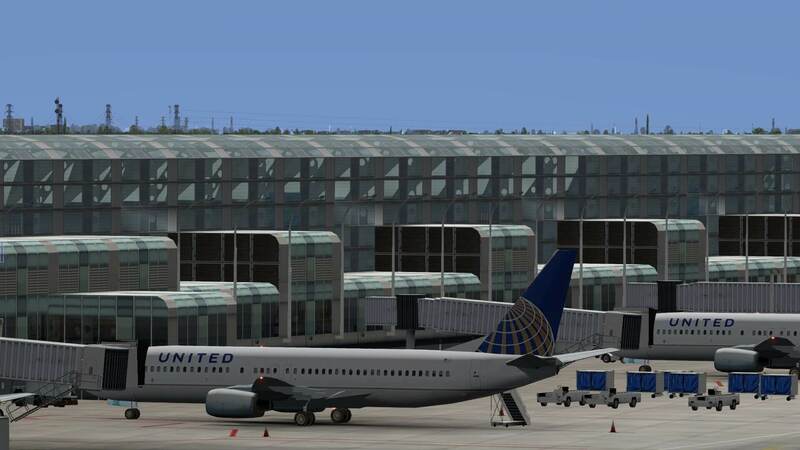 Oddly there’s a passenger United 757 also parked there. Finally, here although no fire trucks present, I did get to see a fire station – Fire Station #1 as it happens. It would have been nice to see a fire truck or two complete the picture. 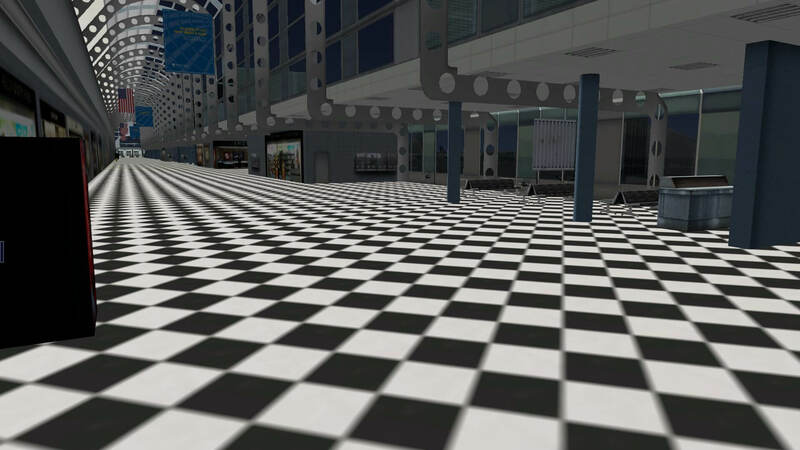 Of course, where is an airport without passengers, and how do passengers get there? By car of course so there are no shortage of car parks, or road signs either. These readable (expensive to park there – $35 a day! and signs for each of the passenger terminals signposted before the tunnel. There is multiple signage so that arriving passengers do not get lost – I know I have, but maybe that’s just Ireland! How does it look by night? Well, as I write this, the sun is setting nicely. I guess I timed my arrival from CYYZ nicely. The lights are starting to appear, and very nicely done they are too. The car-parks are brightly lit, health and safety reasons I suppose, and the cargo terminals signage is very defined and clear. The airport transport vans have rotating beacon lights working (in HDR) of course, and the vehicles even had headlights on when driving around. As darkness falls, the difference in lighting is evident. Terminal 1 seems more brightly lit that the others, since it contains more glass, but it’s not too bright from the outside, it’s the amount of light 8that is spilled outwards to give the impression that the light comes from inside. 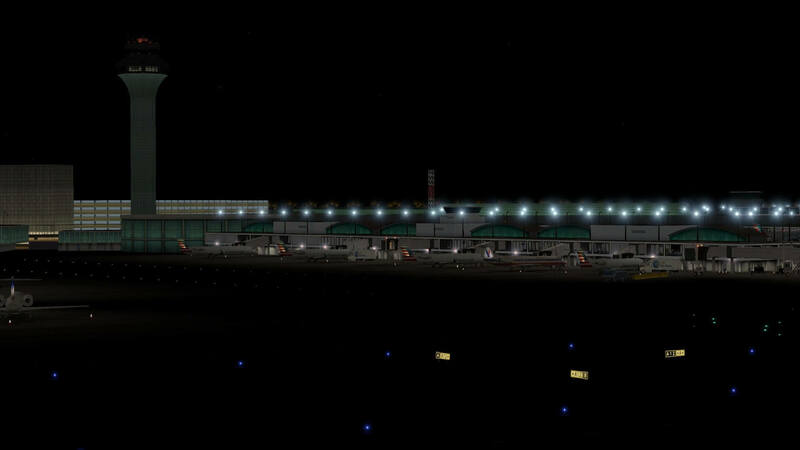 Terminal 2 and 3 are similar to a degree, but terminal 5 and the cargo terminals are more of a yellowish-orange colour – handy for night flights so you have an idea of what terminal you are looking for. This of course is one of X-Plane’s great strengths, after flying in X-Plane 10 at night, returning to P3D and FSX pales in comparison. 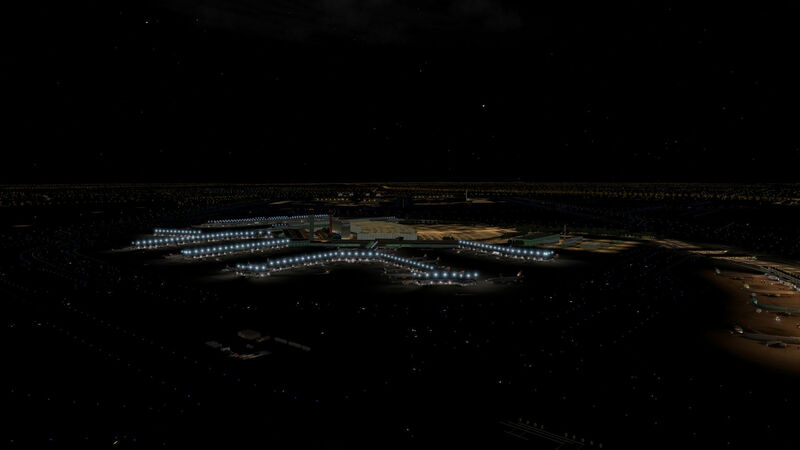 The overall impression at night is that, yes this is a city which has a very big airport indeed. 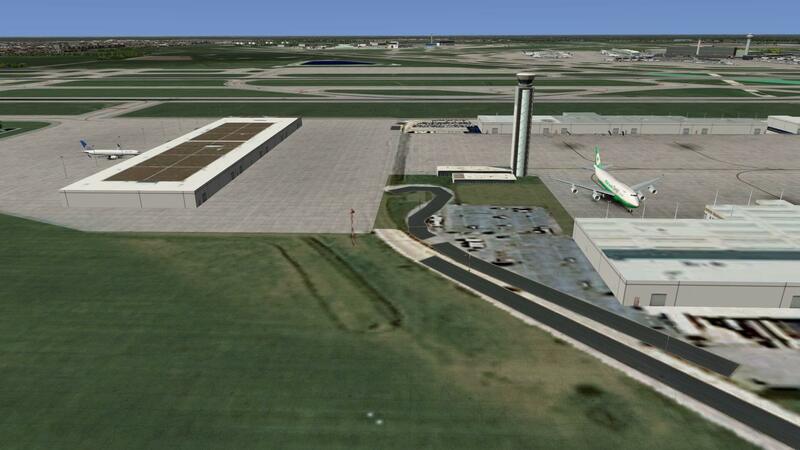 Of course, no airport is complete without runways. 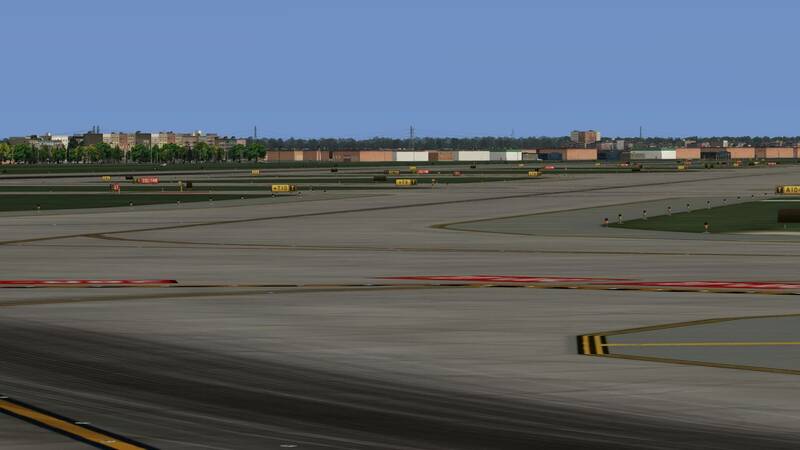 All runways have nicely done tyre marks from landing and taxiing which is a nice touch but expected from a payware scenery. 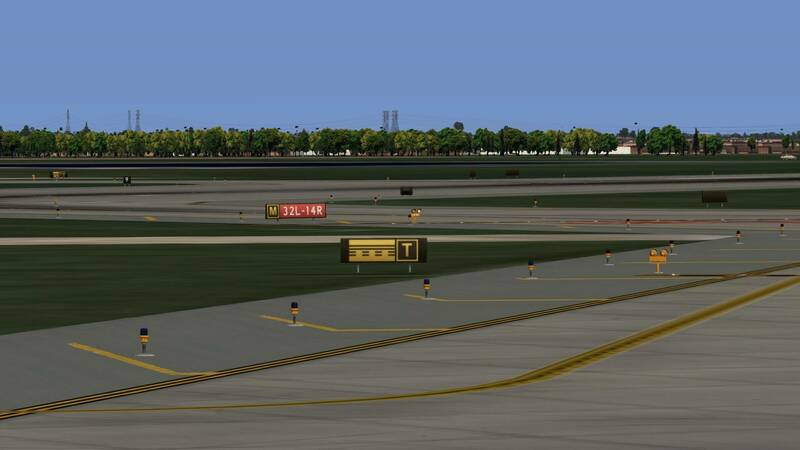 The hold signs and runway placards appear to be correct and display the correct information. 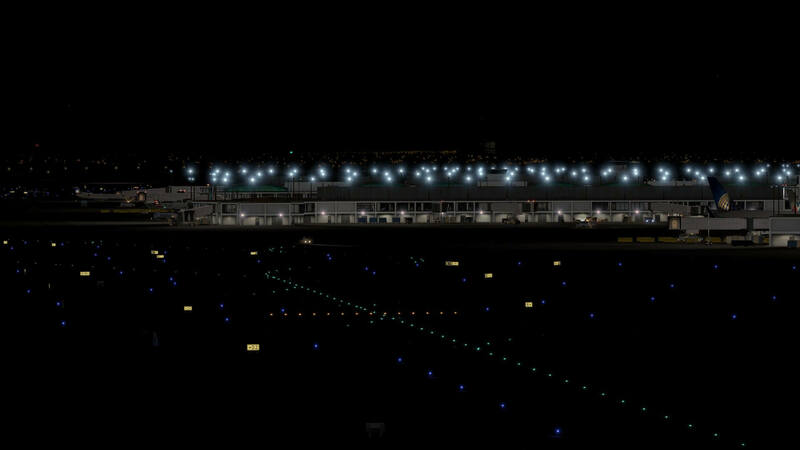 The runway lights and PAPI lighting are working as expected and the runway taxi and centre lights are readily visible and clear. No problems there. On my system, which I guess is a little on the high-end, but certainly not exceptional at this stage I was very happy with the frame rates. 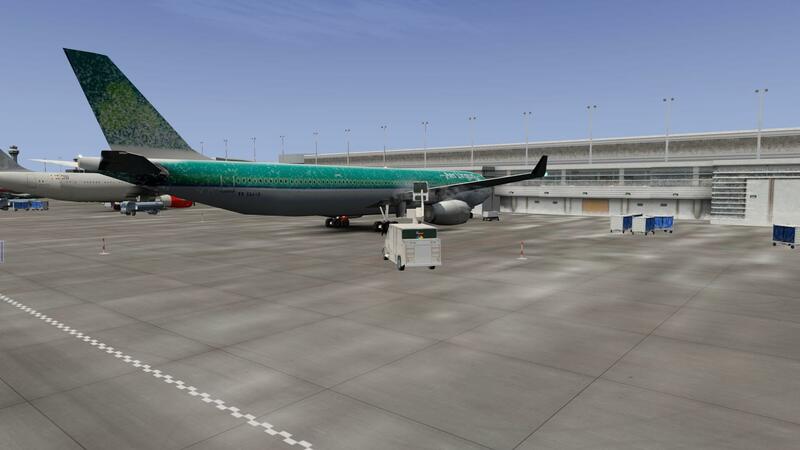 With the MD-80 addon from RotateSim (which is not light on resources i was happily getting 40 fps with my current rendering settings, and with the A330 from JARDesign, I get about 35 fps, still a very good performance taking into account the aircraft’s resources. 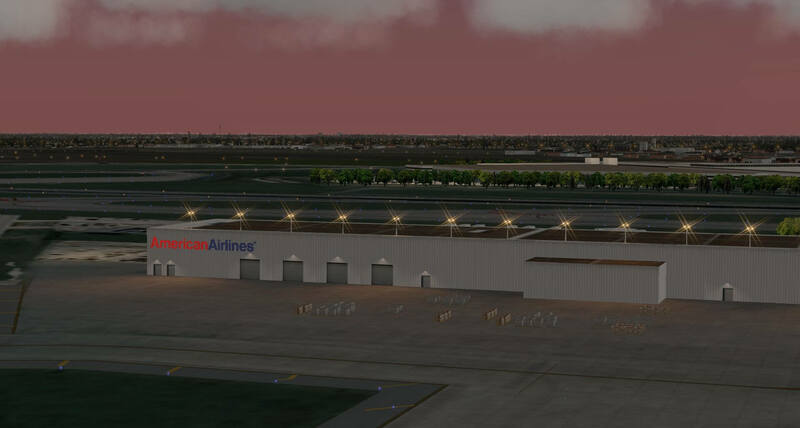 Of course, your mileage can vary greatly depending on your aircraft, your cloud settings, your individual rendering settings and of course lastly but not least – your hardware. On the X-Plane forums, I found that my system is about average and is the recommended system for X-Plane 10. Of course, it is possible to get by with a lower spec machine, but bear in mind what you may need to change to get acceptable performance. There are some good hints in this link which gives a good starting point on getting a good mix between visuals and performance. 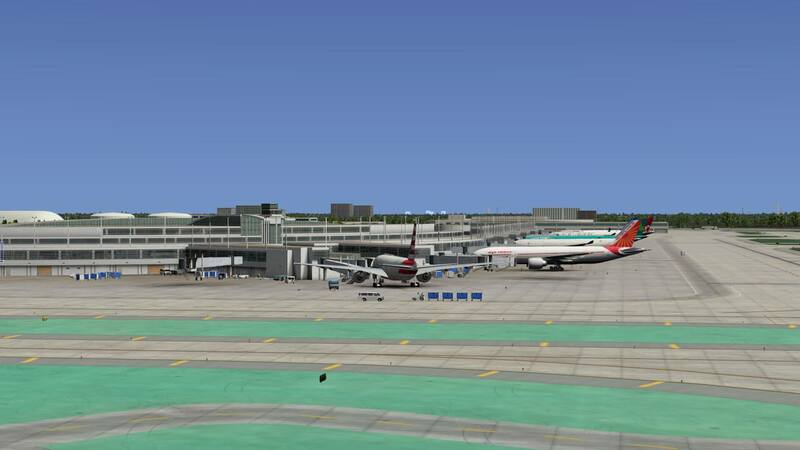 This is one of the better sceneries for X-Plane 10 that I have used so far, and the best from Nimbus that I have used this year. Clearly, he is improving his skills and it shows. It fills a gap in the market for mid-U.S Sceneries. The detailing is much improved over his KMIA offering and it’s well worth the price. 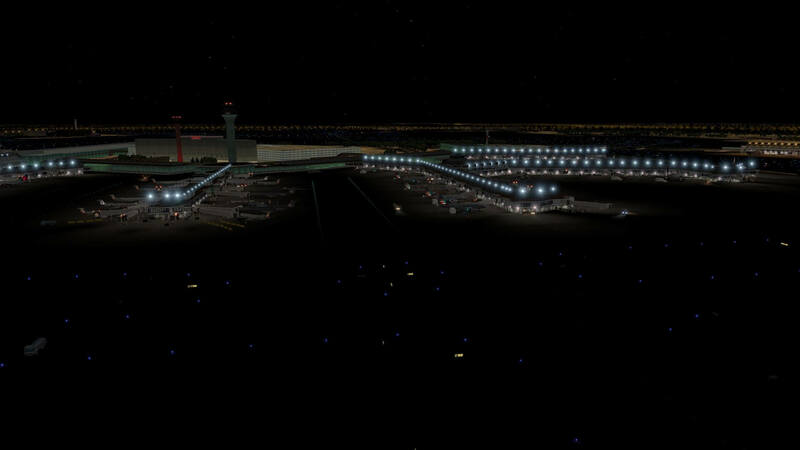 I hope that he keeps updating and pushing forward with his skills and provides us with more and better airports. 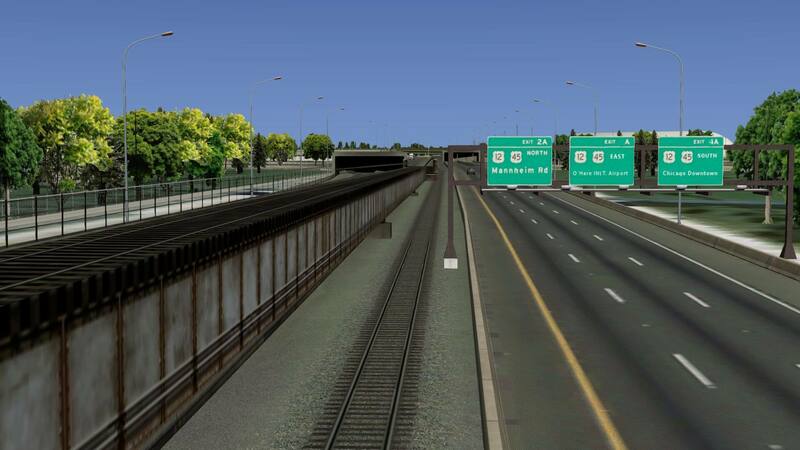 (Hint, how about a KIAD). 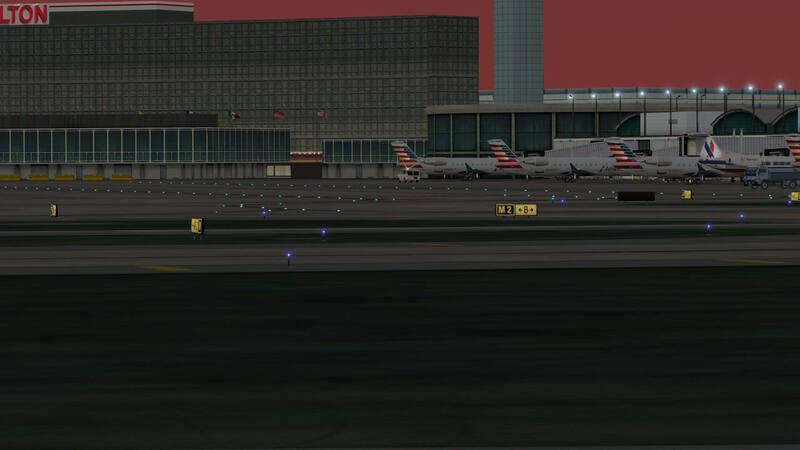 I would have liked to see some fire-trucks just so we know that there is a facility for putting out fires, but apart from that, and the GA section of the airport is quite bare, maybe an update will fix these two points, having said that, it’s a well thought out and fairly large project to roll out. In short, this is a good airport and yes, I would definitely recommend it. The performance is very good even taking into account the aircraft I tested this with. Again, it’s a valuable addition to your destinations and it will get used no matter what type of aircraft you fly. 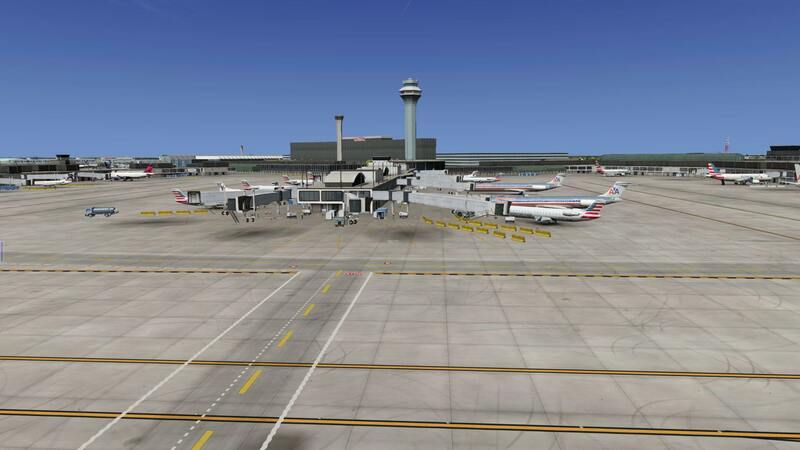 The price of this add-on is currently $24.95 and you get it via this dedicated X-Plane.Org link. 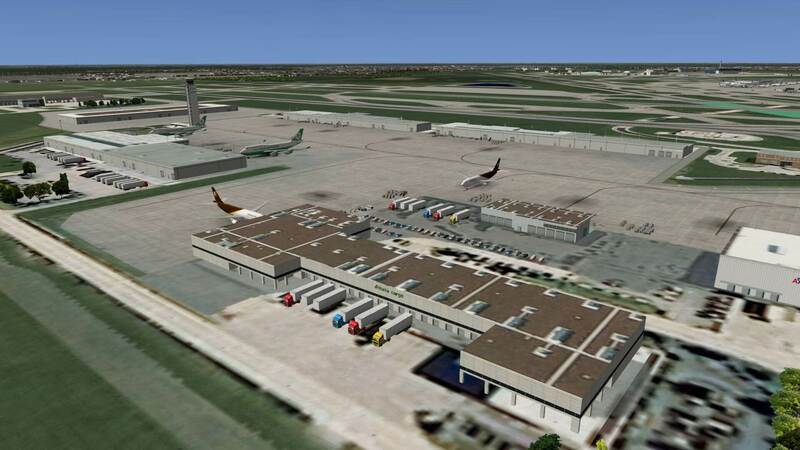 Do you know if it is X-plane 11 compatible? That’\s of course up to the developer, but for sure he will make it 100 percent compatible. AS the product is right now, I haven’t checked that yet.